Nunuvut’s government is staking claim to artifacts from the HMS Erebus – one of two ships from the ill – fated Sir John Franklin expedition of 1845. Nunavut is refusing to issue Parks Canada dive permits unless Parks Canada relinquishes rights to artifacts found and retrieved from the seabed at the wreck sight of the Erebus in the waters of Victoria Strait, just off the coast of King William Island where it was discovered in September 2014. The Erebus is thought to be the ship on which Franklin perished during the ill fated expedition. The other lost ship, HMS Terror has yet to be found. Parks Canada finally relented to the Nunavut request after realizing their divers could face arrest by the RCMP. Permission from Nunavut’s director of heritage must now be consulted before retrieving any artifacts from the site. One of the cannons from the HMS Erebu is lifted to the surface during last year’s artifact recovery mission in the Arctic. Thierry Boyer/Parks Canada photo. In addition to Nunavut, other claimants to the Erebus’ artifacts include the Kitikmeot Inuit, who claim ownership under a land claims treaty, as well as the British, who, since the ships and expedition were of British origin, and based on an agreement drafted in 1997, possess rights to claim any artifacts of “outstanding significance” to their Royal Navy. The agreement between Canada and Britain recognize ownership of the wrecks and their contents by Britain, though it acknowledges Britain will ultimately gift ownership to Canada of everything, except gold, recovered from the wrecks. Parks Canada diver surveys the HMS Erebus. Parks Canada photo. “During the permit application process for the spring 2015 ice dive on HMS Erebus, the government of Nunavut included a condition that denied Parks Canada the authorization to recover artifacts from the wreck site,” says a briefing note for Leona Aglukkaq, who was then the environment minister. The federal cabinet has subsequently declared the HMS Erebus wreck and surrounding waters a national historic site, which took precedence over Nunavut’s permit regulations. However the wreck of the Terror, Franklin’s second lost ship is presumed to be outside the historical site designation therefore creating the same issues and subject to Nunavut’s initial claim of jurisdiction for the HMS Erebus artifacts. 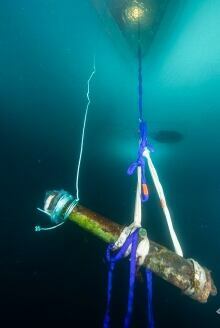 Diver inspects the hull of the HMS Erebus preserved by the Arctic waters. Parks Canada photo. This summer Parks Canada will return to the Erebus wreck site to document artifacts and then continue nearby areas to the north to search for the elusive HMS Terror as well. Hopefully all the ownership and jurisdiction tug – of – wars will ease enough to allow divers to expedite the process before the artifacts are scattered. A portion of the Erebus steering wheel found at the site. Parks Canada photo. A crewman’s boot in good condition was found at the site of the Erebus. Parks Canada photo. The polar bear season has transitioned from Fall to Winter in a little less than a week and now the snow keeps coming. Today, sideways blowing snow and a harsh north wind has put the routine mid – season scare of an early Hudson Bay freeze -up into everyone’s head. This really does happen every year when the first sign of grease ice – slowly undulating surface ice that flows around like grease or oil on top of the water- appears along the coast. Yes it’s around -30 with the wind-chill factor and no relief predicted in the near future …but, all it takes is a good south wind and that ice will be pushed out and gobbled up by the bay. The Churchill River has already developed some pans a little south of the “flats’ area…mostly because of the higher percentage of fresh water flowing out. The upside to freezing of course is the increase in polar bear numbers as well as activity along the coast. Polar bear track in the fresh snow. Brad Josephs photo. Natural Habitat guide Karen Walker had her group out at Cape Merry bustling with action and cold in the biting wind. Driver/guide Koral told some stories of the Hudson Bay Co. and the Jens Munk expedition. After getting up enough nerve to trek up to the Cape Merry battery, the group headed out into the biting wind. What an exhilarating rush to stand up on the cape Merry bluff in the frigid cold and gaze out over the Hudson Bay and see Fort Prince of Wales across the Churchill River. On the winding road back a stop off at the Anglican Church at the edge of town for some history on the Franklin Expedition and a chance to see some amazing stained glass windows in the church itself and the most famous of them all,,the Lady Franklin Window. The soft light of daytime is a perfect time to view them. That night, in a storm on an evening rover trip, night rover, everyone’s expectations for polar bear sightings were low. However, luckily a bear at the end of the lodge.The driver was able to able to pull right up next to him. His head was resting on his front paw and his short legs extended out back behind him, laying on his belly.Later he came right up to the vehicle for a visit. Quite a solitary experience. The next day,the travelers headed out toward Gordon Point and happened upon a couple of young adult males sparring.They put on quite a show for several rovers in the area. Amazing how they can just ignore these massive vehicles and go about their business.Later, traveling down Ptarmigan Alley, the group spotted a few other polar bears walking across the frozen ponds or thermakarsts. Bears can move freely now across the tundra with no open water in their way to divert them. Photographing them moving across these surfaces is optimal. One of the highlights of the trip came the following day, departure day, exploring along Goose Creek Road. “As we crossed Goose Creek, a guest saw something dark below the bridge,running up the frozen creek. It turned out to be a wolverine! (This was my first wolverine sighting ever!!! ).” stated Karen. Further upstream, some other animals were moving around.They turned out to be a cross fox and three river otters! “It was interesting watching all three species of critters encountering each other, but no attack occurred.” she added. ” While this was happening on our left, a beautiful red fox appeared downstream on our right.This fox was much closer, so the guests’ attention was drawn to him. He later made an appearance for us while we were at the marina observation tower.” reported Karen The partially frozen creek with the frost on the trees & the new snow made it into a winter wonderland out there. Wow, what a morning!!! A red fox gazes curiously at some guests. Brad Josephs photo. Four guests also went flightseeing on a helicopter and saw a moose as well as some bears along the coast. Some other travelers went dog sledding with Kelly and Churchill River Mushing and had an amazing time. Back in the warming tent hot cocoa and trail stories warmed the blood. What a trip! This dramatic weather change proved timely for Natural Habitat photo group and their guide Colby Brokvist. upon arrival the group took some dramatic pics of the stone inukshuk by the Hudson Bay. In addition to the fantastic red light reflecting off the cloud filled sky, the group set up some spotlights for a dramatic affect. The following day on the tundra, a playful young female polar bear greeted the rover right off. later near Gordon Point revealed some bears up-close and some light sparring activity. The rocky frozen coastline with chunks of tidal ice combined with amazing sunlight made for varied, interesting shots. On the way back to launch,a sow with two cubs set against a background of soft glowing sun and silhouetted stunted spruce trees made for epic photos. Action packed sparring near the lodge. Colby Brokvist photo. The final two days on the land were highlighted by sparring bears at the tundra lodge and close looks at a snowy owl just near a little esker. Then a bear on the rocks just past the airport. Back out at the lodge three sets of sparring bears kept shutters clicking incessantly . One set, later morning, was only 20 yards off the rover’s side and close in action shots were captured. The ride back provided more chances for snowy owl shots. In other news, for the second consecutive year, conservation officers and RCMP raided Brian Ladoon’s dog compound at mile 5 and removed six bears lurking around for “dog” rations. His mafiaesque photo nad tour business seems to be doomed at this point. “Cracker shots throughout town the last two nights. Things are ramping up here!”, reports Colby.